TM & © 2014 Huddy Buddy. All Rights Reserved. Huddy Buddy is a registered trademark. "But I don't wanna go back to work!" Huddy Buddy (the kid) arrived in 2003 and was reason enough to give up corporate life. After eight long years "workin' for the man", it was time to start hangin' out with my new little man. We quickly noticed that he was dressed like every other kid at the playground, so we wanted to create some fun and unique tees for Huddy and his friends to wear. 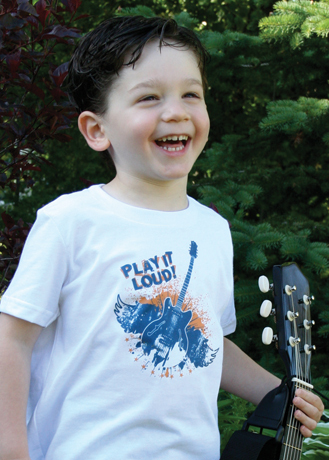 Huddy Buddy (the company) offers a great selection of casual tees for all the cool kids in the neighborhood. Inspired by Huddy and his pals – and designed by Daddy – our tees and one-pieces will have your little ones running around in style. With the arrival of Huddy's "buddies" (a sister in 2006 and baby twins – a boy and a girl – in 2009), we've expanded the line to focus on siblings and multiples, so that all your kids have something fun to wear. We use only top-quality 100% cotton, ethically-made-in-the-U.S.A. garments, hand screened in small batches with the softest inks. They're sure to be a unique addition to your little one's wardrobe, or a great gift. Huddy Buddy (the kid and the company) want you to feel good about your purchase, too. So a percentage of every sale is donated to the Huddy Buddy Fund (#8100) supporting The Hospital for Sick Children.